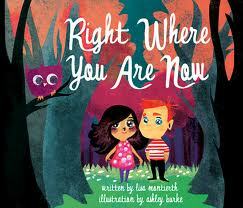 Right Here You Are Now is a bedtime story for kids. It’s also scientifically accurate, so it’s more than just a bedtime story–it’s an educational adventure. This book will help kids understand geologic time. Seems pretty important to me. Excellent, thanks Ken. Was looking for science themed kids books in the weekend and came away disillusioned. Perhaps though the first book “Right where you are now” is slightly poorly named for a book that’s sure to have international appeal.